Bulking aka the attempt of building muscle through eating more calories and lifting weights often gets butchered and leads to very unsightly bodies. So what are the biggest mistakes one can make when bulking? bodybuilding , not belly building. 2. 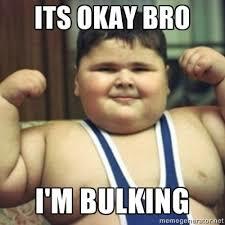 Bulking for too long. As much fun as eating a surplus is, all good things must come to an end. The main issue is that , not matter what we do, we will build a certain amount of fat along with the muscle. Said fat competes for the same hormones as the muscles, namely testosterone and growth hormone. The more fat we have, the less of those hormones goes toward the muscle building process. So after 8-10 weeks of bulking, you might want to reduce the calories by 30 % to let your body breathe and stop fat gain. Often, we are told ” do not do cardio because it burns calories” . 1. Cardio does burn very few calories and 2. doing some cardio will help with digestion, recovery and overall health. “Lift big to get big, bro!” is another common fallacy that leads to the typical bench, squat, row workout. While you certainly should use compound exercises , it pays to remember to also work with some insulation and stretch respectively contraction exercises to ensure a complete workout. Once again the bodybuilding world has it upside down: when dieting the athlete is supposed to do a higher volume than when bulking. Now let’s look at the video tape: train less when you have more energy aka food available? That makes no sense at all, if anything the opposite should hold true. Do not be afraid of significantly ramping up the volume during a bulk. After all, food is the most anabolic substance there is so lets put it to good use. I summarized all this in a video, please note it was shot with a high def camera in the youtube studios so enjoy the much improved quality!! Previous post: Things you do not need to do to get in great shape! Next post: Should teenagers train the same way like adults?